Another great gift idea from Janna Salak! 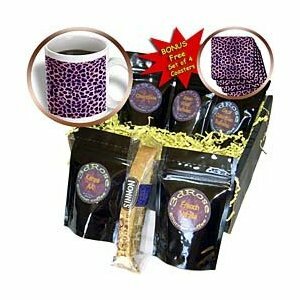 Your friends and family will love the purple Cheetah Animal Print Coffee Gift Basket! Gift basket is measuring 9x9x4. Contains 15oz animal print mug, BONUS free set of 4 animal print coasters, biscotti and 5 blends of gourmet coffee. French Vanilla, Kenya AA, Decaf Colombian Supremo, Chocolate and Italian Roast Espresso elegantly presented in our signature black planet coffee gift box. A very nice and thoughtful gift for any occasion.